The lure of football will undoubtedly remain strong for tight end. 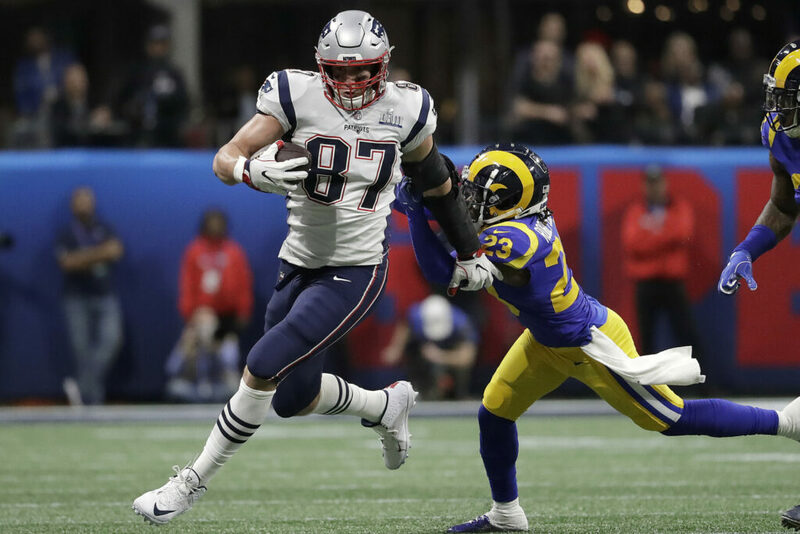 PHOENIX — Rob Gronkowski’s retirement announcement Sunday night hurts the New England Patriots’ chances of winning another Super Bowl considerably. Gronkowski’s exit could hasten the end of the Patriots’ dynasty. If he remains retired, that is. If Gronkowski truly walks away from this taxing sport on his own terms and at his own time, good for him. He has given plenty to football and to the Patriots. He has been a great player, so great that he certainly is headed to the Pro Football Hall of Fame. He has given what his body has had to give. He’s had enough. He is said to have been careful with his money. If he can make a post-football career for himself in acting or elsewhere, everyone should wish him a happy, healthy and prosperous rest of his life. But Gronkowski is still a relatively young man, even in football terms, shy of his 30th birthday. At some point, maybe his aches and pains won’t seem quite so debilitating. The lure of football undoubtedly will remain strong. The Patriots probably will be back in the running for yet another Super Bowl next season. What if he could, say, miss training camp and a portion of the regular season, and return to play the games that matter most? There are some in and around the league who wondered Sunday, even as Gronkowski’s contributions were being celebrated by the Patriots and others, if he really will be done with football. Fellow tight end Jason Witten has returned to the Dallas Cowboys after a season in ESPN’s “Monday Night Football” broadcast booth. What’s to stop Gronkowski from making his retirement similarly temporary? The Patriots will move on from Gronkowski as best they can. That’s what Coach Bill Belichick does. He has discarded very good Patriots players throughout their dynastic run, always finding a way to keep the victories piling up. But this might be different. Gronkowski has been a mainstay of the second half the Patriots’ dynasty. He is a three-time Super Bowl champion, a four-time all-pro and a five-time Pro Bowler. Other than quarterback Tom Brady, few players have meant more to the Patriots’ success. Brady has made things work with underwhelming wide receivers, less than productive running games and ineffective offensive lines. He has been able to compensate in seasons when the New England defense hasn’t been the best. But for the past nine seasons, Brady always has been able to exploit one mismatch, at least whenever Gronkowski has been healthy and on the field. It can’t last forever, no matter how much Belichick and Brady make it seem like it can. The end is in sight for the Patriots. Brady was still a very good quarterback this past season at age 41. But he wasn’t the league MVP that he’d been before. He turns 42 in August. Belichick turns 67 in April. They are the constants. But now they’ve lost a leading member of the supporting cast. If Gronkowski really stays away, the next championship for Belichick, Brady and the Patriots — if there is a next championship — would be the most wondrous of all.